The developments of nanofabrication in the past years have enabled the design of electronic systems that exhibit spectacular signatures of quantum coherence. Nanofabricated quantum wires and dots containing a small number of electrons are ideal experimental playgrounds for probing electron-electron interactions and their interplay with disorder. Going down to even smaller scales, molecules such as carbon nanotubes, fullerenes or hydrogen molecules can now be inserted in nanocircuits. Measurements of transport through a single chain of atoms have been performed as well. Much progress has also been made in the design and fabrication of superconducting and hybrid nanostructures, be they normal/superconductor or ferromagnetic/superconductor. Quantum coherence is then no longer that of individual electronic states, but rather that of a superconducting wavefunction of a macroscopic number of Cooper pairs condensed in the same quantum mechanical state. Beyond the study of linear response regime, the physics of non-equilibrium transport (including non-linear transport, rectification of a high frequency electric field as well as shot noise) has received much attention, with significant experimental and theoretical insights. All these quantities exhibit very specific signatures of the quantum nature of transport, which cannot be obtained from basic conductance measurements. Basic concepts and analytical tools needed to understand this new physics are presented in a series of theoretical fundamental courses, in parallel with more phenomenological ones where physics is discussed in a less formal way and illustrated by many experiments. "Do not expect easy reading, but thorough (and for the connoisseur finger licking) discussions that help filling the gaps in research (and even topical review) articles (...). Nevertheless, most chapters are less concerned about formal mathematical rigour rather than the all-important physical intuition necessary for contact with reality. Concluding, this book is a must for the determined graduate student, postdoc or researcher in theoretical nanoelectronics. It is recommended reading for a general readership that will appreciate the relatively complete coverage of recent developments. It is a useful reference volume for any group library in experimental and theoretical nanophysics". Gerrit E.W. Bauer, Technical university TU, Delft, The Netherlands. 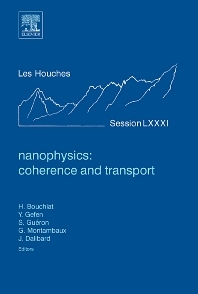 Hélène Bouchiat research activity since 1988 is devoted to coherent transport in mesoscopic systems and molecular wires. Her main contributions are related to persistent currents and ac conductance in mesoscopic rings and more recently proximity induced and intrinsic superconductivity in carbon nanotubes. Gilles Montambaux works on the theory of quantum transport in disordered and interacting electronic systems. His main contributions concern persistent currents, energy levels statistics, quantum transport in networks, decoherence effects. He has published a book on the mesoscopic physics of electrons and photons.